Tweez­ers made from hard­ened steel are typ­i­fied by their par­tic­u­larly hard tips, which en­sure great dura­bil­ity. The tweez­ers are mag­netic and the ma­te­r­ial is not non-rust­ing. 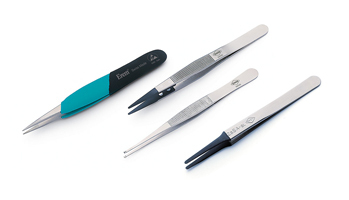 Tweez­ers made from stain­less steel have ro­bust tips and are non-rust­ing. The ma­te­r­ial is less hard than hard­ened steel. Stain­less-steel tweez­ers have the iden­ti­fi­ca­tion let­ter „S“ in their order num­bers. This alloy is non-mag­netic. The tweez­ers are non-rust­ing, acid-proof and heatre­sis­tant up to 300°C (512°F). Tweez­ers made from spe­cial stain­less steel tweez­ers have the iden­ti­fi­ca­tion let­ter „SA“ in their order num­bers. Ti­ta­nium tweez­ers are light weight and re­sis­tant to high tem­per­a­tures.